This name uses Spanish naming customs: the first or paternal family name is Flores and the second or maternal family name is Garcia. Wilmer Alejandro Flores Garcia (born August 6, 1991) is a Venezuelan professional baseball infielder for the Arizona Diamondbacks of Major League Baseball (MLB). He played in MLB for the New York Mets from 2013 through 2018. Flores signed as an international free agent out of Venezuela with the Mets on August 6, 2007, his 16th birthday. He was rated in the Top 100 prospects by Baseball America prior to the 2009 (#47), 2010 (#88) and 2011 (#59) seasons. Flores started at second base for the World team at the 2009 All-Star Futures Game. He also has been named to the Baseball America Rookie All-Star Team (2008), the APP Post-Season All-Star Team (2008), the MiLB.com Organization All-Star Team (2010) and the South Atlantic League All-Star Team (2010). In 2011, the Mets sent Flores back to the St. Lucie Mets of the Class A-Advanced Florida State League (FSL) to convert him from a shortstop into a third baseman. In 2012 Flores was selected at third base for the FSL All-Star Game. He went 3-for-4 with a run scored and three runs batted in, earning Most Valuable Player honors. He also appeared in the All-Star Futures Game for the second time in his career. The Mets promoted Flores to the Binghamton Mets of the Class AA Eastern League during the 2012 season. He finished the 2012 season with Binghamton batting .311 in 66 games with 8 home runs, 33 RBIs, and 20 walks. Flores began the 2013 season with the Las Vegas 51s of the Class AAA Pacific Coast League. He finished his 2013 season with the 51s batting .321 in 107 games with 15 home runs, 86 RBIs, and 25 walks. He gained a promotion to the Mets on August 6, on the day of his 22nd birthday. Pitcher Bobby Parnell was placed on the disabled list with a herniated disk in his neck to make room for Flores on the roster. He made his debut that day against the Colorado Rockies at Citi Field going 0-for-4 at the plate and committing an error in the sixth inning in what would be a 3–2 Mets win. On August 7, he notched his first career major league hit, a single in the bottom of the second inning off Rockies pitcher Jhoulys Chacín. In the bottom of the eight inning, with bases loaded, he hit a base clearing double off pitcher Manny Corpas for his first three major league RBIs. The Mets would go on to win 5–0. On August 11, he hit his first career home run, a solo home run to right field off Arizona Diamondbacks pitcher Heath Bell in the top of the ninth inning to extend the Mets lead to 9–5 by which the Mets won. He finished the 2013 season appearing in 27 games with a batting average of .211 in 95 at-bats in 101 plate appearances while compiling 20 hits, 13 RBIs, 1 home run, 5 walks, 8 runs scored and striking out 23 times. Flores started the 2014 season with the 51s, but was called up April 2 along with Kyle Farnsworth to replace Bobby Parnell going to the disabled list and with Daniel Murphy on paternity leave. He would be re-sent back to the 51s on April 6 to make room for Jon Niese coming off the disabled list. Flores had only started one game at second base going 0-for-4 with two strikeouts. He was recalled on May 9 with Omar Quintanilla being designated for assignment. On June 2, Flores drove in a career high 6 RBIs during which he also hit his first career grand slam against the Philadelphia Phillies at Citizens Bank Park. The grand slam came in the top of the ninth inning off pitcher Phillippe Aumont with two outs extending the lead 11–2 to which the Mets won to. On June 26, Flores was once again re-sent down to the 51s to make room for Juan Lagares coming off the disabled list. He was recalled for good on July 24 with Kirk Nieuwenhuis being sent to the 51s. Flores finished the 2014 season appearing in 78 games with a batting average of .251 in 259 at-bats in 274 plate appearances while compiling 65 hits, 29 RBIs, 6 home runs, 12 walks, 28 runs scored and striking out 31 times. Flores made the Mets' roster for Opening Day in 2015. During the first week of the season, Flores struggled offensively and defensively as he made three errors and batted .158 in seven games. In nine games since the opening week, Flores batted .364 with three home runs, which was tied for second most among NL shortstops. He was tied with Brandon Crawford of the San Francisco Giants. Soon thereafter, Flores was tied for third in all of baseball in errors committed with six while he and Daniel Murphy committed ten of the Mets' seventeen errors. On May 13, Flores was seventh among National League shortstop leaders in Wins Above Replacement. On May 16, Flores became the first National League position player to hit a grand slam batting ninth in a National League ballpark. The home run came off Milwaukee Brewers pitcher Matt Garza with one out on a 1–1 pitch count with the score 2–0 extending it to 6–0 in the bottom of the fourth inning at Citi Field. The home run was his sixth of the season and his second career grand slam. On May 26, Flores at the time was tied for most home runs hit by a shortstop with Jhonny Peralta of the St. Louis Cardinals with seven. That same day, Flores hit his first career walk-off, a single, off Phillies' pitcher Elvis Araújo in the bottom of the tenth inning with two outs scoring Juan Larges for his second RBI of the game. Flores sliding in a run against the Baltimore Orioles on August 18, 2015. On July 29, rumors spread during the Padres-Mets game that Flores had been traded to the Milwaukee Brewers, along with pitcher Zack Wheeler, for Carlos Gómez. Despite the rumors, Flores remained in the game, and was visibly emotional when he returned to the field as fans began to give him a standing ovation. Flores later explained his disappointment in learning that he would be leaving the only baseball organization he'd ever known. However, following the game, General Manager Sandy Alderson told the media that no trade had occurred, saying "social media got ahead of the facts." After the game, Mets' manager Terry Collins told the media that he knew nothing about the potential trade and had told Flores while the events played out, "Listen, I don't know what's going on, but you've got a game to play, let's play baseball." It was later reported that the Mets backed out of the trade after a concern about Gómez's physical as a medical report showed an issue with his hip. Two days later, on July 31, Flores hit his first career walk-off home run, a solo home run, off Washington Nationals pitcher Felipe Rivero. It came in the bottom of the 12th inning, on a 1–1 count with no outs, winning the important game for the Mets by a score of 2–1. As Flores approached home plate finishing his circle around the bases, he memorably tugged enthusiastically at the "Mets" logo on his uniform front, signifying how happy he was to have remained with the team. Flores had also driven in the other Mets' run earlier in the game. During each at-bat, Flores received a standing ovation from the Mets' fans. The win brought the Mets within two games of first place in the NL East. After the incident, Flores became a fan-favorite of Mets fans and was given standing ovations in the subsequent weeks, both at home and at away games. It was also the only walk-off home run the Mets hit during the 2015 season. At this point on August 25, since the failed trade, he hit .343 with a .993 OPS and four home runs. The Mets went 16–6 after that day. Flores finished the 2015 season appearing in 137 games with a batting average of .263 in 483 at-bats in 510 plate appearances while compiling 127 hits, 16 home runs, 59 RBIs, 55 runs scored, 19 walks, and striking out 63 times. In the NLDS against the Los Angeles Dodgers, he hit .300 in four games while compiling 3 hits, 1 double, 2 walks, 2 runs scored and striking out 4 times. He then batted .286 in four games while compiling 4 hits, 1 double and 1 triple, 1 walk, 1 stolen base and striking out 2 times against the Chicago Cubs in the NLCS. During that series against the Dodgers, Mets' shortstop Ruben Tejada was injured by the Dodgers' Chase Utley, who took him out with a controversial slide, thought dirty by many. Flores played shortstop for the rest of the postseason. Once he slid over to the more important defensive position, Flores stopped hitting. He was the last out of the World Series, striking out looking in game five against Kansas City Royals closer Wade Davis, to clinch the series for the Royals. Flores appeared in all five games, batting .059 with 1 hit, 2 runs scored, 2 walks and 3 strikeouts. In December, Flores suffered a broken left ankle after being hit by a pitch in winter ball in Venezuela. On May 12, Flores was put on the 15-day disabled list with a left hamstring injury with his spot on the roster being replaced by Sean Gilmartin. Flores was batting .180 with one home run and two RBIs in 50 at-bats this season playing at first, second and third base filling in as a defensive replacement for Lucas Duda, Neil Walker and David Wright respectively. Flores was activated from the DL on May 29 with Matt Reynolds being sent down to make room for him on the roster. In five rehab games with the Binghamton Mets, Flores had batted .235 with one RBI and four hits. On July 3, in a home game against the Cubs, Flores became only the second Mets player to collect six hits in a game, the first being fellow Venezuelan infielder Edgardo Alfonzo, who did so in August 1999. In doing so, he raised his batting average 31 points from .224 to .255. He became the first player in Major League Baseball to accomplish the feat since C.J. Cron the day earlier and the first player in the National League to do so since Charlie Blackmon on April 4, 2014. On September 10, Flores injured his wrist in a collision at home plate with Atlanta Braves catcher A. J. Pierzynski. On September 30, the Mets announced that Flores would miss the rest of the year, including the postseason. On October 7, Flores underwent surgery to have part of the hamate bone in his wrist removed. On April 21, the Mets placed Flores on the 10-day disabled list with an infection in his knee which required hospitalization and IV treatment. Flores broke his nose on a foul-tip in the second game of a double-header against the Houston Astros on September 2, which ended his season. For his 2017 campaign, Flores finished with a .271 batting average, 18 home runs and 52 runs batted in in 336 at-bats. On April 15, 2018, Flores hit a walk-off home run to give the Mets a win against the Brewers. This was his third career walk-off home run. 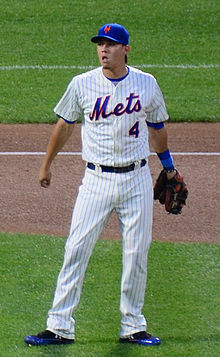 On June 26, Flores drove in the winning run against the Pittsburgh Pirates in the bottom of the 10th inning, giving the Mets a 4–3 victory. Earlier in the game, he had driven in the Mets' first two runs as well. Flores's game winner was his 9th walk-off RBI of his young career. He tied David Wright for the most walk-off RBIs in Mets' history. On July 9, in the first game of a doubleheader against the Philadelphia Phillies, Flores hit a pinch-hit walk-off home run, breaking Wright's record for the most walk-off RBI of any player in Mets franchise history. The Mets did not tender Flores' contract at the end of the season, which made him a free agent. On January 21, 2019, Flores signed a one-year, $4.25 million contract with the Arizona Diamondbacks. 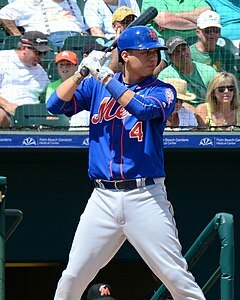 ^ "Mets Prospect Wilmer Flores Is on Fast Track to the Majors". New York Times. March 15, 2009. Retrieved November 11, 2011. 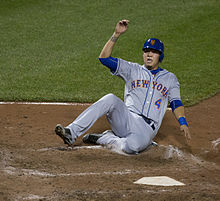 ^ "Mets' Wilmer Flores weeps on field amid trade rumors – that appear false". CNN.com. July 31, 2015. Retrieved July 31, 2015. ^ "Flores leads South to All-Star win". Milb.com. June 17, 2012. Retrieved August 6, 2013. 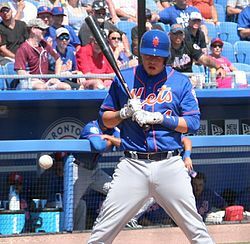 ^ "Wilmer Flores itching for promotion to the majors". Newsday.com. July 8, 2012. Retrieved August 6, 2013. ^ "Wilmer to join Mets on Tuesday". ESPN. August 6, 2013. Retrieved August 6, 2013. ^ "Bobby Parnell to DL with herniated disk in neck, may need surgery". MetsBlog.com. August 6, 2013. Retrieved February 13, 2016. ^ "Wilmer Flores was 'too excited' in his debut". MetsBlog.com. August 7, 2013. Retrieved February 13, 2016. ^ "Final Score: Mets 5 Rockies 0". MetsBlog.com. August 7, 2013. Retrieved February 13, 2016. ^ Flores crushes his first career homer. August 12, 2013. Retrieved February 13, 2016 – via YouTube. ^ "Parnell on DL; Mets call up Farnsworth, Flores". ESPN.com. Associated Press. April 2, 2014. Retrieved April 2, 2014. ^ "Wilmer Flores sent to Triple-A, Jon Niese activated from DL". MetsBlog.com. April 6, 2014. Retrieved February 13, 2016. ^ "Wilmer Flores will be promoted, Quintanilla DFA'd". MetsBlog.com. May 8, 2014. Retrieved February 13, 2016. ^ "Flores' grand slam". SNY. June 3, 2014. Retrieved February 13, 2016. ^ "Juan Lagares activated, Wilmer Flores sent to Triple-A". MetsBlog.com. June 25, 2014. Retrieved February 13, 2016. ^ "Flores called up from Triple-A, Nieuwenhuis optioned". MetsBlog.com. July 24, 2014. Retrieved February 13, 2016. ^ "Mets finalize their opening day roster". MetsBlog. April 4, 2015. Retrieved February 13, 2016. ^ "Mets Opening Day roster". MetsBlog.com. April 6, 2015. Retrieved February 13, 2016. ^ "Wilmer Flores had a rough week, Alderson thinks he'll be fine". MetsBlog.com. April 14, 2015. Retrieved February 13, 2016. ^ "Wilmer Flores had iffy start, now middle of the pack among NL shortstops". MetsBlog.com. April 27, 2015. Retrieved February 13, 2016. ^ "Collins has no answer, says be patient with Wilmer". MetsBlog.com. May 1, 2015. Retrieved February 13, 2016. ^ "National League WAR Leaders at Shortstop". MetsBlog.com. May 13, 2015. Retrieved February 13, 2016. ^ "Batting last, Flores' slam an NL first". MetsBlog.com. May 16, 2015. Retrieved February 13, 2016. ^ "Mets put up 10-spot, end 5-game losing streak". MetsBlog.com. May 16, 2015. Retrieved February 13, 2016. ^ Flores belts a grand slam to pad lead. May 16, 2015. Retrieved February 13, 2016 – via YouTube. ^ "Wilmer Flores is tied for MLB lead in HR for SS". MetsBlog.com. May 26, 2015. Retrieved February 13, 2016. ^ Flores hits walk-off single in the 10th. May 26, 2015. Retrieved February 14, 2016 – via YouTube. ^ "Colon hit hard as Mets fall to Padres". MetsBlog.com. July 29, 2015. Retrieved February 13, 2016. ^ "Wilmer Flores Cries After Learning He'd Been Traded, Stays In The Game (UPDATE)". Deadspin.com. July 29, 2015. Retrieved July 30, 2015. ^ "TC knew nothing about rumored trade, told Flores to stay in the game". MetsBlog.com. July 29, 2015. Retrieved February 13, 2016. ^ Sources: #Mets backed out of trade due to concern over hip issue with #Brewers' Gomez. July 29, 2015. Retrieved February 13, 2016 – via Twitter. ^ "Flores hits 12th inning walk-off, Mets top Nats". MetsBlog.com. July 31, 2015. Retrieved February 13, 2016. ^ Flores drills walk-off homer to left-center. July 31, 2015. Retrieved February 13, 2016 – via YouTube. ^ "Mets' Flores goes from tears to cheers". CNN.com. August 1, 2015. Retrieved August 1, 2015. ^ "Wilmer Flores has been on fire since almost being traded to the Brewers". MetsBlog.com. August 25, 2015. Retrieved February 13, 2016. ^ "Wilmer Flores breaks ankle in winter ball, expected to be ready for spring". CBSSports.com. December 8, 2015. Retrieved December 11, 2015. ^ "Mets place Wilmer Flores on DL, recall Sean Gilmartin". MetsBlog.com. May 12, 2016. Retrieved May 13, 2016. ^ "Flores activated off DL, in starting lineup in place of Wright". MetsBlog.com. May 29, 2016. Retrieved May 30, 2016. ^ Fitzpatrick, Mike (July 3, 2016). "Wilmer Flores has six hits as Mets finish sweep of Cubs". New Haven Register. Associated Press. Retrieved July 4, 2016. ^ "Rare Feats". MLB.com. Retrieved July 4, 2016. ^ Puma, Mike (October 1, 2016). "Season's over for 'frustrated' Wilmer Flores". New York Post. Retrieved October 5, 2016. ^ DiComo, Anthony (October 7, 2016). "Wilmer Flores has surgery for wrist injury". MLB.com. Major League Baseball. Retrieved October 12, 2016. ^ "Mets' Flores, Duda Headed To Disabled List". CBS Sports. April 21, 2017. Retrieved April 21, 2017. ^ Adler, David. "Mets place Duda, Flores on disabled list". MLB. Retrieved April 21, 2017. ^ "Mets shut down Wilmer Flores for rest of the season with broken nose". September 7, 2017. ^ "Mets' Wilmer Flores hits walk-off home run vs. Brewers". Newsday. April 15, 2018. Retrieved January 16, 2019. ^ "Mets' Wilmer Flores is King of the Walk-Off". SNY. Retrieved January 16, 2019. ^ Botte, Peter. "Walk-off Wilmer: Mets take Game 1 of doubleheader against Phillies thanks to Flores' late-game heroics – NY Daily News". nydailynews.com. Retrieved January 16, 2019. ^ Puma, Mike (November 30, 2018). "Wilmer Flores not tendered contract by Mets". Nypost.com. Retrieved January 16, 2019. ^ "Wilmer Flores, Diamondbacks finalize $4.25M, 1-year contract". Sports Yahoo!. Retrieved January 22, 2019. Wikimedia Commons has media related to Wilmer Flores.